One problem with touch interfaces is the way that a users fingers hide (or occlude) the target point at the critical moment just before touching the screen. Also, the touch area of the finger is much larger than a pixel on the display. In addition, Apple filed a patent application (Jan 2007) for a handheld device (or iPod) that displays its output on a small front-side display screen but receives input through a larger touch- and force-sensitive interface on the rear of the device. Read more details at Apple Insider. 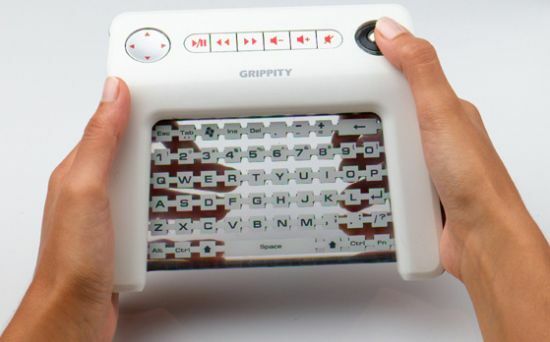 The Grippity Keyboard is a concept for a handheld wireless device, featuring a full qwerty keyboard where you type using keys on the rear of the device. It also incorporates an orientation sensor that is used to effectively double the number of available entry keys.